With a loud thump, my wife dropped a huge pile books on the kitchen table. She had just started her first semester of nursing school, and the huge pile of books were required for her courses. From the size of the stack, and the titles on the books, I had not a doubt in my mind that I would never become a nurse, or any other practitioner of anything medical. “I’m beat,” she sighed, “I’m going to bed”. “Goodnight, love,” I called after her, feeling sorry for her. The amount of reading, studying and memorizing Latin medical terms that was to come in the next four years seemed insurmountable to me, and she had only completed day one. After she had gone upstairs, I remained on the couch watching television. The pile of books kept grabbing my attention. I was curious what could be in them. I understand the human body is a very complex machine, but there had to be twenty thousand pages or more contained within the tall stack of books. By my estimate, that would mean there had to be at least a few hundred pages on the pinky toe alone—what could you possibly write about the pinky toe to fill up a couple hundred pages? I would think you could give names to every single cell in the pinky toe in that number of pages, and still have room leftover to include that stupid this little piggy went to market. Another ten minutes went by before I could stand it no longer. I had to know what was in those books. Looking through the volumes stacked on the table, I picked out the one that seemed the most interesting to me, an encyclopedia of diseases, and pulled it out of the pile. With monstrous book in hand, I plopped back down on the couch, grabbed my soda, and opened to the first page. My eyes got big, my jaw dropped, and I nearly let go of my drink. I was not prepared for what lay waiting within. I thumbed through the first twenty pages—fear, terror – I’ve never seen anything like that in my life, not even in a horror movie. Inside this humongous book was what must be every single terrifying, appalling and shocking disease known to mankind…and with detailed descriptions and pictures. There were hundreds, maybe thousands of photos showing swollen, infected body parts. Body parts with pocks and blisters. Body parts that were oozing and mangled. Missing body parts, extra body parts. There were so many diseases and symptoms that the chances of me not having at least one, if not a dozen of them, had to be nil. I couldn’t put the book down. With trembling hands, I rifled through another fifty pages. Around page thirty-two, I had started a list of potential diseases that would surely end my life. Tumors (I had several suspected tumors) and liver failure—I was sure I could feel pain in my liver. Skin cancer wasn’t even on the suspected list. It was a sure thing, and possibly in more than one location. It wasn’t a matter of if I was dying, it was just a matter of which disease would win out over all the others and claim the prize. Flipping another page, I leaned in to focus on a picture of a hand with six fingers (Polydactyly) and suddenly became aware of a presence next to me. I turned to find my four-year-old daughter, Natalie, had at some point sat down on the couch next to me. I must have been too engrossed in the book of horrors to notice. She sat wide-eyed and holding up her hand, counting her fingers. “I’ve been here a long time, daddy. What is that?” she asked, pointing at the picture of the polyad– , I mean, hand with six fingers. She held up her hand and pointed at the bump on her thumb that was made by her first knuckle. “I think that’s another finger,” she said with trembling lip. She didn’t seem convinced, but hopped from the couch and scurried back up the stairs. For privacy, and to utilize the vanity mirror to better inspect the hard to reach body parts, I moved my disease search into the bathroom and locked the door. I continued my morbid research into the night, my list of suspected diseases growing, and the creation of the list of my diseases that were a sure thing. At 2 AM, I could no longer keep my eyes open. The voice was my wife’s, and it startled me. Opening my eyes, I noticed it was daylight. 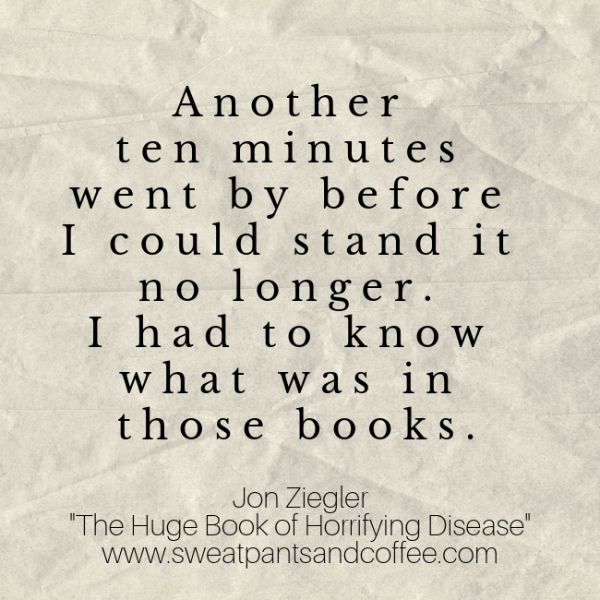 I had fallen asleep on the couch with the Huge Book of Horrifying Diseases and Sickness lying open on my chest. My wife stood over me clutching several pages of my frantically scrawled disease lists. “Oh, nothing…” I murmured in my still-foggy state. She looked down at her book on my chest, and then back at my lists in her hand. “Skin cancer, Diabetes, Polio, Tourette’s?” she continued. “Give me that,” I grumbled, lunging at my papers, but failing to get a hand on them. “Cervical Cancer? You have Cervical Cancer on your list of suspected diseases? “Oh, yeah…I should probably switch it to the sure thing list, huh?” I replied gravely. Dropping the lists, she grabbed her book from my chest and began stomping out of the living room, but then stopped suddenly. “Wait a minute…does all this have something to do with Natalie telling me that she is growing a sixth finger?” She was mad now. “NO MORE,” she shouted, pointing at the evil book, and then continued stomping out of the room. She had only been in nursing school one day and had already grown so callous to pain and suffering of others that it didn’t even bother her that her own husband was dying. She now keeps her books under lock and key when not studying—as if me not reading them will stop the legions of disease from ravishing my body. But I don’t need her or her stack of books. I have discovered an even more efficient method of self diagnosis…WebMD.